We met in August of 1985 in San Antonio, Texas. Today, we are currently living in Cambodia. A lot has happened in between. God is at work in Cambodia. Be a part of what He’s doing. We met in August of 1985. Tim owned and operated a nutrition business inside an elite chain of health clubs in San Antonio, Texas. Dhana had just moved with family from Chicago, and was trying to get acclimated to a new city. She got a job as a receptionist at the health club where Tim worked, and on her first day of work, an invitation to join him at Bible Study. A year and a week later, we were married! We are blessed with five remarkable sons, three wonderful daughters-in-law, and two precious granddaughters. Six years ago we took our first team from Living Water to a church/orphan home with Foursquare Missions International missionaries Ted and Sou Olbrich. The children we saw had lost and endured unimaginable things. Yet they were filled with something that we all needed more of, and we quickly realized that although they were so young, they were full of the Holy Spirit. The children we met radiated joy unspeakable in the face of horrific circumstances. We knew we were being called to be a part of what God was doing in Cambodia. Two years ago, the Lord spoke to Tim at the annual Foursquare Pastor’s Conference as the speaker prepared for the offering. The speaker said, “I heard the Holy Spirit say, there are a few people in this audience tonight who, regardless of if you give to this offering tonight, you need to get into the offering!” Tim knew that night that he was being called to Cambodia, and that whatever it took, whatever cost would have to be given, we wanted to obey God’s voice. We immediately began preparing to move to Cambodia, and in early 2015, were given the honor of becoming Foursquare missionaries to Cambodia. Our goal is to build the local church, share the Gospel, train and release upcoming leaders, and love people! Cambodia is a land ravaged by war and full of beauty. In 1975, the Khmer Rouge, a communist oranization, captured Phnom Penh, the capital city. At least 1.5 million Cambodians died from starvation, forced labor, or execution during the Khmer Rouge regime. Although UN-sponsored elections occurred in 1993 and 1998, the Khmer Rouge did not fully surrender until 1999. Years of political strife and fighting have left behind a legacy of brutality, and millions of people who have lost loved ones, suffered, and are now rebuilding. Cambodia is a predominately Buddhist country with a high risk of infectious diseases, prevalent hepatitis A, malaria, and AIDs. Human trafficking is a high risk, especially for young children orphaned by years of fighting and disease. In spite of all the darkness, God is on the move in Cambodia. FCOPi operates 106 church orphan homes, caring for children who receive love, education, safety, and the assurance that they are loved by God. These children are not just surviving; they’re thriving! We’ve watched as children who’ve grown up in orphan homes become doctors, prayer warriors, and begin to work with the younger generation to help them survive the odds. In the midst of all this, God has brought the two of us to minister. We spend our time serving the Cambodian church and its leadership, developing and training upcoming leaders, helping to make sure family life is healthy and whole, and bringing awareness to the ongoing mission of FCOPi. From holding newborns, helping doctors, leading marriage seminars, and everything inbetween, God has given us an amazing adventure here, and we’re just living it one day at a time! You can find out about our latest adventures at our blog. We couldn't be in Cambodia, doing what we're doing, without amazing people like you who have chosen to partner with us. We’re a part of the Foursquare Church and Foursquare Missions International (FMI) in particular. The Foursquare Church embraces the belief that man sinned and Christ died to redeem us. We believe that salvation comes entirely by the grace of God, and that He gives it to everyone who asks. Foursquare Missions exists to “take the whole Gospel to the whole world.” FMI currently has missionaries in 136 countries, and we are grateful to be a part! One of our big goals in Cambodia is partnering with Foursquare Children of Promise International. 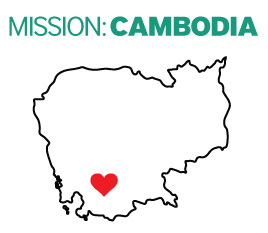 This organization exists to “meet urgent needs and do good deeds to bring holistic health to hurting and oppressed people.” FCOPI currently operates 106 church/orphan homes in Cambodia, with a goal to care for children, provide vocational training for those in need, and more. Over 15,000 children have been a part of a FCOPI home. There’s no telling what God can do with those 15,000 lives! HOW CAN YOU SUPPORT the mission? Financially - We can't do this without your financial support - CLICK HERE to join our team through special gifts or ongoing support. Prayer - We know that prayer changes everything, and that anything is possible when people pray. Join our prayer team here. FCOPi - CLICK HERE to sponsor a church/orphan home in Cambodia. Thank you for allowing us to be your hands and feet in Cambodia. Your financial gifts sustain us on the field. They allow us to train future leaders, care for those in need, and bring the message of the Gospel to those who desperately need it.